A few weeks ago, I had a craving for apple cider donuts. I did a quick search, skimmed through a few recipes, and decided to go with the ones from Sally’s Baking Addiction. 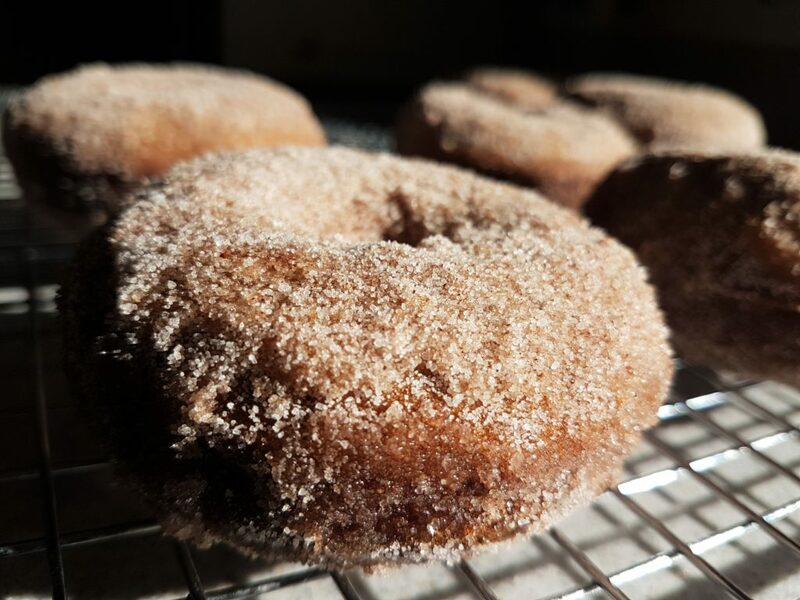 That was a very good decision, because I not only discovered a fantastic recipe for cider donuts, but found one of my new favorite baking resources. 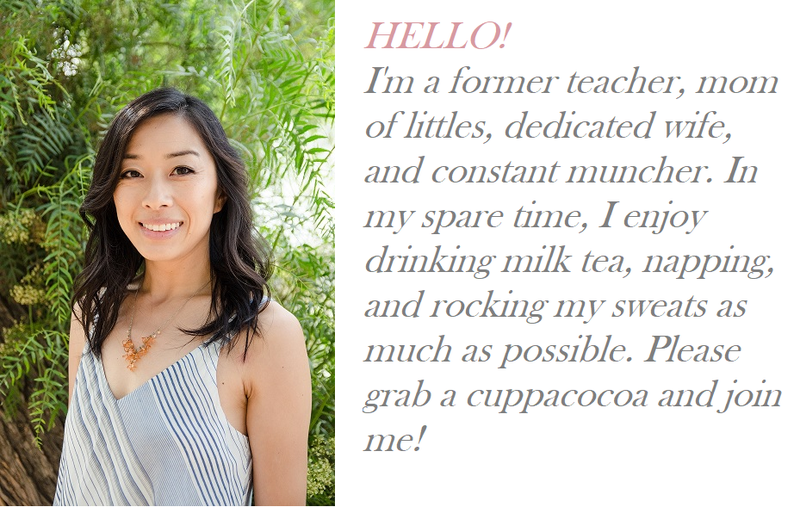 Seriously, if you enjoy baking, her website is a treasure trove of mouthwatering recipes! I made them once, and devoured them. They were delicious. I made them again, doubling the batch and sharing with friends. But I think I experimented too much with the spices this time, and was disappointed that the apple flavor of the apple cider didn’t come through as strongly. So I made them again yesterday for a family gathering. This time, I played it safe with the spices (no pumpkin spice or cloves heh) and I found a way to pack in even more apple flavor! You see, the key to this recipe is to take regular apple cider and reduce it (i.e. boil it down) so you get a lot more apple cider-y flavor in the 1/2 cup that remains. If you just used 1/2 cup of regular apple cider in the recipe, there would barely be any apple cidery flavor in your donut. But if you start with the 1 1/2 cups of apple cider that her recipe calls for, and boil it down and let the water evaporate until you’re left with 1/2 cup of liquid, then it will have a much more concentrated apple cider flavor. And if you take it one step further and start with 3 cups of apple cider and reduce it to 1/2 cup, you will have an even MORE powerful apple cider flavor. So that’s what I did. 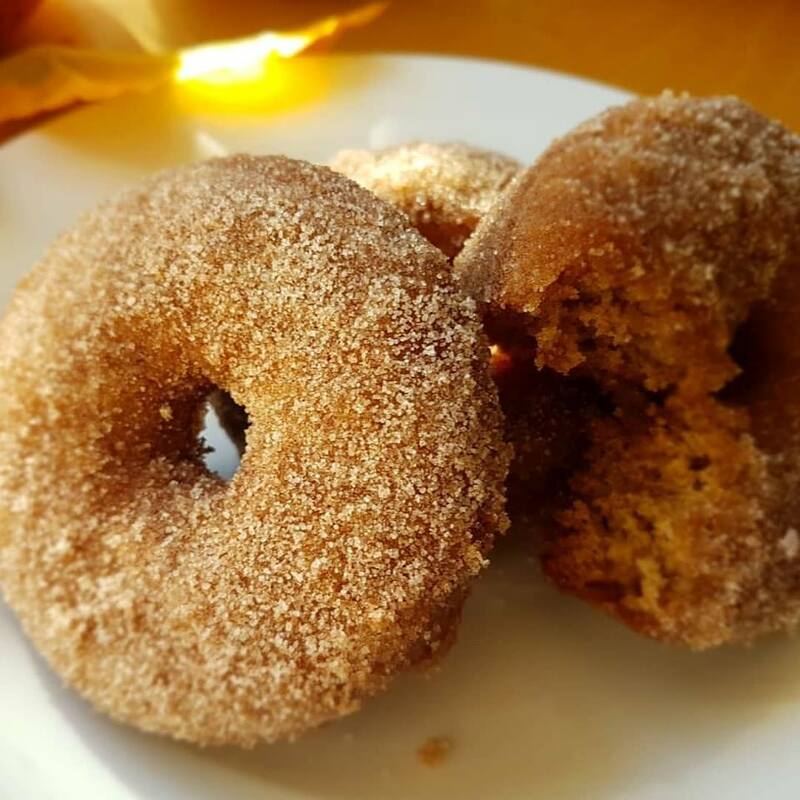 I made the apple cider part more cidery, I did a simpler version of the “apple pie spice” (didn’t want to buy cardamom), and now I can’t stop eating apple cider donuts. At least they’re baked, right? Speaking of which, you’ll need a donut pan (affiliate link) to make these. I have one of these. I really wish I had two to save on bake time! But I’m glad I was able to return the 20-cavity one I had ordered, because it is just way too big to store anywhere. These need to be enjoyed FRESH and with HOT COFFEE. That’s what I had this morning and it was pure bliss, and I am determined to give others the opportunity to recreate this delightful moment for themselves. Reduce the apple cider: In a small saucepan, bring the apple cider to a rolling boil, then immediately turn the heat down to a simmer. Let it simmer over low heat until you’re left with about 1/2 cup of liquid. I had it at just over a simmer, and it took maybe an hour to reduce. I did it the night before I actually made the donuts, while making dinner. If you’re short on time, start with just 1 1/2 cups of apple cider and reduce it to 1/2 cup–it will take closer to 20 minutes and will still be delicious! Set it aside to cool. Preheat oven to 350°F. Spray donut with nonstick spray and set aside. Make the donuts: Whisk the flour, baking soda, baking powder, cinnamon, nutmeg, and salt together in a large bowl. Set aside. In a medium bowl, whisk the melted butter, egg, brown sugar, granulated sugar, milk, vanilla extract, and reduced apple cider. Pour into the dry ingredients and whisk everything together until smooth and combined. Batter will be slightly thick. Spoon the batter into the donut cavities. I like to use a pastry bag to pipe the batter in (or you could use a large zip top bag and cut the corner off). Fill each well about halfway. Bake for 10-11 minutes, or until the edges and tops are lightly browned. To test for doneness, poke your finger into the top of a donut. The donut should bounce all the way back to the original shape. If there’s even a slight dent, then let it keep baking. Cool donuts for 2 minutes then transfer to a wire rack. Re-grease the pan and bake the remaining donut batter. 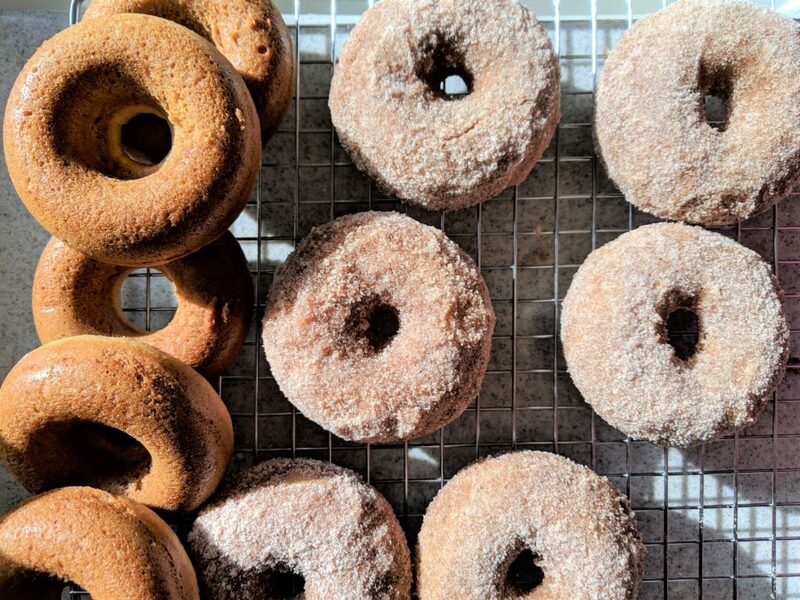 Coat the donuts: Combine the granulated sugar, cinnamon, and nutmeg in a medium bowl. Once cool enough to handle, dunk both sides of each donut in the melted butter, then generously in the cinnamon sugar topping. Tip: Designate one hand as the “wet hand” that does all the dunking in melted butter, and the other hand as the “dry hand” that does all the coating in cinnamon sugar. That way, your fingers won’t get coated themselves, and you won’t get what Alton Brown calls “club hands,” as previously discussed and illustrated here!). Donuts are best enjoyed immediately, but can keep, tightly covered, at room temperature for up to 2 days. She also says you can freeze them (coated or not coated in the cinnamon sugar) for up to 2 months. To reheat, thaw overnight in the refrigerator and warm up in the microwave for a couple of seconds. I haven’t tried this yet, but it would probably be good! My friend also said she has made these with a muffin tin and it still tasted good! Thank! I really like donuts. I want to try to make the weekend! Yum! Hope it was delicious!